Cocktail parties and girls’ night get a magical upgrade with David and Patricia Beets’ colorful salts. To collect their colorful salts, David and Patricia Beets chisel the surface of a rainbow with a unicorn horn. Ok, maybe our imagination went wild, but this unique set is to blame in the best possible way. The multi-colored salts make cocktail parties or girls' night a touch more magical. The set includes four vegetable-dyed salts: blush pink, green, orange, and teal. Mix and match, or color code each glass so guests can keep track of theirs. 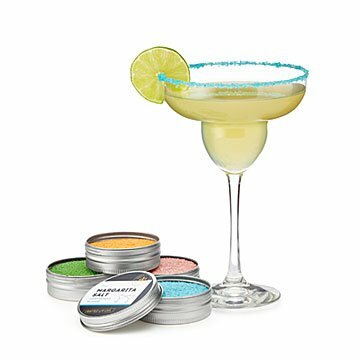 They make an enchanted gift for your favorite host or margarita-loving friend. Handmade in Illinois. Contains enough salt to garnish approximately 180 margaritas. A perfect little thank you gift! I ordered this for a friend that hosts most of our book club meetings and hosts a lot of little parties. Since she is a big margarita fan, I thought this would be something she would enjoy. She loved it! The 4 salts come packaged in small metal tins, inside a tissue lined kraft box. The different colors really pop on the glass - and honestly were just fun to use (she opened them up right away!) The only thing to be aware of is that the tins are small in size, so the salt needs to be put in/on something else so that the glass can be rimmed. I am guessing each tin would easily rim 20-30 glasses.